What is Your Turn? Each day-long skiing event is brought to you by Bob Ward's, Elan Skis, Dalbello Boots, and Discovery Ski Area. Your Turn Ski Clinics return this year with two full days of women-only instruction. Each day-long skiing event is brought to you by Bob Ward&apos;s, Elan Skis, Dalbello Boots, and Discovery Ski Area. 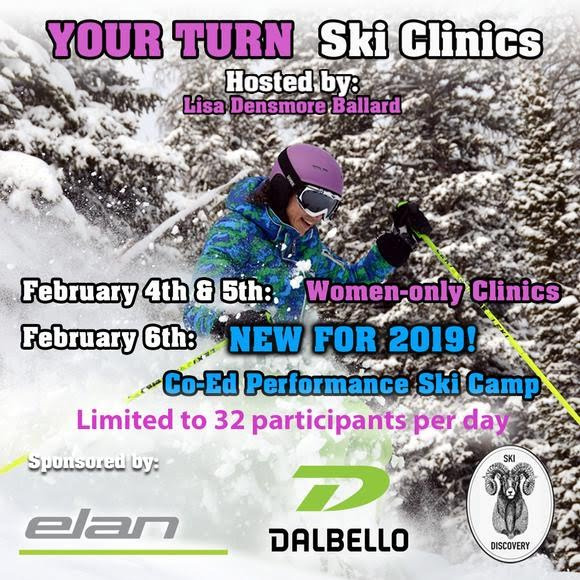 Your Turn Ski Clinics return this year with two full days of women-only instruction. The women-only event&apos;s purpose is to increase awareness about the latest women-specific ski equipment, have a fun informative day on the hill for all participants through the use of current tuned women&apos;s gear and a high level of instruction. The event targets women who ski at an intermediate level and above, who want to take their skiing to the next level, who have not had a recent lesson or skied in awhile, and enjoy having fun and making new friends. Space is limited to 32 women, per day. NEW FOR THIS SEASON! A third day has been added to the schedule and invites a co-ed group to participate in the first Your Turn Co-ed Performance Ski Camp. This full day for men and/or women focuses on improving techniques and tactics for skiing in various conditions such as moguls, crud, powder, steeps, and carving. Even great skiers can take their skills up a notch with this camp. Sign up for one of the women-only events or the co-ed event below. Space is limited to 32 participants. 3:30pm Apres-Ski Party...Wine & Cheese...Poster signing...Door Prizes! Lisa Densmore Ballard has been involved in many aspects of the ski world. A member of the U.S. Ski Team in the late 1970&apos;s and a six-year veteran of the Women&apos;s Pro Ski Tour in the 1980&apos;s, Lisa has competed in ski racing for most of her life. Today, she is a standout on the master&apos;s circuit, with 4 world titles and 100 national titles across all alpine disciplines. She has been the number one ranked skier in her age group and a member of the U.S. Alpine Masters Ski Team since she joined the master&apos;s circuit 1991. In addition to competition, Lisa has been a highly regarded ski instructor and coach for over 20 years. During the 1990&apos;s, she was the instruction editor for Snow Country and then Mountain Sports & Living magazines, introducing and refining ski technique on shaped skis in the United States. Lisa was Director of the Snow Country Ski Schools and later the RSN Alpine Excellence training centers in conjunction with the PSIA Alpine Demo Team. At the same time, she founded the Head-Subaru Women&apos;s Ski Clinics which have now become the Your Turn Women&apos;s Ski Events. Over 6,000 women have had breakthroughs in their skiing while taking Lisa&apos;s clinics. Lisa has also coached numerous junior and adult race programs over her long career and is currently director of the master&apos;s program and a coach for FIS-level racers at her home mountain in Red Lodge, Montana. In addition to helping people improve on-snow, Lisa has written hundreds of articles and produced and hosted numerous television shows on skiing. She has covered the sport for networks such as ESPN, Fox Sports, ABC, NBC, CBS, A&E, The Weather Channel, The Travel Channel, PBS, and Outside TV. She has served as a consultant to many ski gear manufacturers and ski resorts on their women&apos;s products and programs, and she periodically speaks on women&apos;s skiing topics at national ski trade events. She has written 7 books, including Ski Faster! (McGraw-Hill), a top-selling ski instructional book. When the snow melts, Lisa works as a professional freelance writer, photographer and TV/film producer specializing in adventure travel, conservation and outdoor genres. She splits her time between Red Lodge, Montana and the Adirondacks in New York where she grew up. She enjoys hiking, camping, fly fishing, waterskiing and paddling with her husband Jack Ballard, her son Parker, and Jack&apos;s three children.